O ne of the most traditional—and delicious—Lenten dishes in Mexico is this Capirotada recipe for a type of bread pudding with cheese that is both sweet and savory at the same time. Legend says that Capirotada was invented as a way to use up leftovers before beginning the Lenten fast. Now it shows up on the table throughout the season, and especially during Holy Week itself. Since meat was traditionally forbidden during Lent, the pudding may have grown in popularity as a way to get more protein into a meatless diet, in the form of cheese. That layer of cheese, bubbling and browned on top of the pudding, also likely gave it its name. "Capirotada" comes from the word for a friar's hat. Capirotada has a very long history. Capirotada recipes were recorded by the Holy Office of the Spanish Inquisition in the mid-17th century and can still be found in the archives there to this day. It is typically made from ingredients in common use in Spain at the time of the Conquest. Some New World touches were added along the way, and it's popular to this day throughout the Hispanic world. The list of variations in the traditional Capirotada recipe is enormous. Every self-respecting Mexican cook will have her own version. But there are a few staples that must be included—without stale bread, a spiced sugar syrup, raisins and and cheese it just isn't Mexican Capirotada. Many include tomatoes and onions, adding a rich and delicious complexity. For many Mexicans, the smell of Capirotada bubbling in the oven is the smell of home. This is definitely comfort food, Latin style. Good Mexican cooks are artists, and any traditional Mexican recipe is going to have many variations. Here is an authentic Capirotada recipe, but certainly not the only authentic recipe. (I don't want to start a cultural war here among Mexican cooks.) 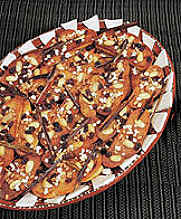 The recipe's very flexibility means you can make any number of substitutions and changes and still have real Capirotada. Put the bread chunks in a bowl. Melt the butter, drizzle over bread and toss to coat. Spread on a baking dish and toast under a broiler for 5 minutes or so, turning as needed until nicely browned and crisp. Remove from broiler and set aside. Butter a 9"x13" baking dish. In a medium saucepan, mix water, crushed piloncillo, cinnamon, clove, tomato, and onion. Bring to a boil, then simmer 5-10 minutes or until slightly thickened into a syrup. Pour through a strainer and discard solids. Keep syrup warm. In a buttered casserole dish, layer 1/3 of the bread cubes. Sprinkle with 1/3 of the raisins, nuts and cheese. Drizzle about 1/4 or less of the syrup over this layer, letting it soak into the bread. Continue layering bread, raisins, nuts and cheese, sprinkling each with syrup. Finish with a layer of cheese. Pour the rest of the syrup over the whole dish. Bake for 30 minutes, until the top layer of cheese is bubbling and browned. Serve warm. For bolillos, substitute stale French bread. 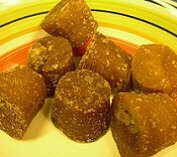 For piloncillo, substitute packed dark brown sugar.